Be it a hack or a mod, DIY technology is fun – and sometimes it can be even more innovative than the gadgets produced by big companies. Instructables member Patrick (or as his mother calls him, Mizchief100) has created a nifty helper for the visually impaired. He calls it VIA, or Visual Impairment Aid. The wrist-mounted device employs both sound and vibration to alert the user of nearby obstacles. It resembles a Spider Sense t-shirt in that they both use an ultrasonic distance sensor. 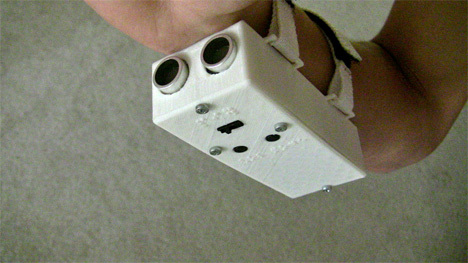 The framework of the VIA was 3D printed, with braille labels for the power switch and two function buttons that allow the wearer to switch between buzz and beep. It may sound like a game, but it could be seriously helpful. See more in Do It Yourself or under Technology. August, 2013.